Yesterday I installed S/O and my first impressions (I tried with Squeezelite / LMS) were very promising. My DAC is a Lampizator with Combo384 Amanero, DSD256 ready. Today I activated S/O and installed the HQPlayer NAA as instructed in the walkthrough on this forum. The result looks OK: see screenshot. However, HQPlayer does not recognize the DAC. I tried with HQPlayer from a Linux machine and from a mac: same result. Is there anyhing else I should do to make this work? I think it's a permission problem, hopefully I'd be able to confirm this in the near future and this should be fixed in the next pre-release. (03-Oct-2016, 08:56 PM) agent_kith Wrote: I think it's a permission problem, hopefully I'd be able to confirm this in the near future and this should be fixed in the next pre-release. Thanks! In the meantime I will play with JRiver MC22 and/or Squeezelite which recognize the DAC without problem. Looking forward to comparing them with HQPlayer + NAA. And thanks for developing this lightweight audio OS. It would be worth something to get optimal sound via de minimalist route, so that I no longer need JPlay, Audiophile Optimizer, Fidelizer Pro, Process Lasso, etc. [networkaudiod] (22884): networkaudiod Copyright © 2011-2016 Jussi Laako / Signalyst. All rights reserved. Is there anybody here who succeeded with HQP/NAA on Snakeoil? Me and a.dent got this working back in May. See this thread (click), about the second page onwards. Because every time you install NAA you're downloading a new version from their server, my suspicion is that the current version is a newer version and requires some additional settings. I spent the whole night yesterday getting my home Internet back up and running so didn't get to test this. Hopefully I can do so later in this week. Yes I got NAA working but had to use an old version to get it to work. Try installing an earlier version of NAA and see how you go. I'm away from home for a week so I can't access my Snakeoil machine to confirm the NAA version. I will say that I use Roon/HQ Player on my mac mini serving to NAA on my Snakeoil machine. The SQ is the best I have heard on my system. This disables IPv6 dual-stack support in networkaudiod and falls back to IPv4-only." However, HQP still does not see my DAC. I will also try an older NAA version if I can find it. Cool... I'd add this to the next beta release. Today I got it to work after some troubleshooting. I now play with HQP into NAA on Snakeoil. Sound is good! I just have to do the IP6 tweak above and restart networkaudiod before I can play. So hopefully that will no longer be necessary after the next upgrade. Jussi Laako advised me on the Computer Audiophile forum. When I mentioned that "[...] the OS system page shows PCH as card 0 and the Amanero as card 1" he responded: "This sounds like you have a GUI in your NAA machine. You shouldn't have any GUI, only text console. If you have a GUI, you also likely have "pulseaudio" installed and running and that is a big steaming pile of **** similar to CoreAudio and Windows mixer/rate converter audio engines. You need to make sure pulseaudio doesn't mess with the device, at least by modifying it's configuration or preferably removing it from the system altogether." Any comments? Would it be possible to de-activate pulseaudio in Snakeoil, or is it already harmless? (06-Oct-2016, 12:18 AM) bodiebill Wrote: Today I got it to work after some troubleshooting. I now play with HQP into NAA on Snakeoil. Sound is good! I just have to do the IP6 tweak above and restart networkaudiod before I can play. So hopefully that will no longer be necessary after the next upgrade. (06-Oct-2016, 12:18 AM) bodiebill Wrote: Jussi Laako advised me on the Computer Audiophile forum. When I mentioned that "[...] the OS system page shows PCH as card 0 and the Amanero as card 1" he responded: "This sounds like you have a GUI in your NAA machine. You shouldn't have any GUI, only text console. If you have a GUI, you also likely have "pulseaudio" installed and running and that is a big steaming pile of **** similar to CoreAudio and Windows mixer/rate converter audio engines. You need to make sure pulseaudio doesn't mess with the device, at least by modifying it's configuration or preferably removing it from the system altogether." Snakeoil by default runs only in console mode. There is only one console (tty1) and you can even disable that in the Snakeoil tab. The only exception is when one needs to run a GUI music player (e.g. JRiver), where a virtual desktop is used. 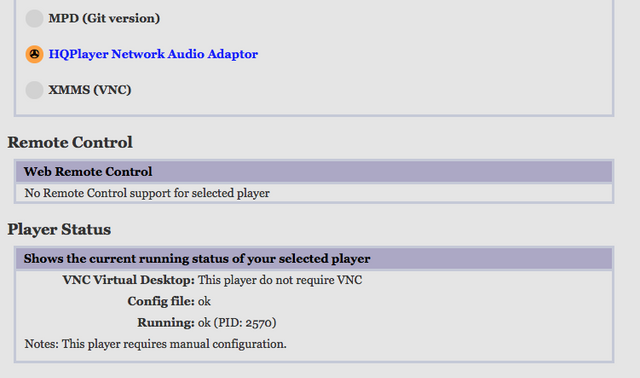 PCH could well be the on board sound card on your motherboard. You should be able to disable Intel HD audio or Azalia codec (PCH may call this something else now though) in your system's BIOS and. Once disabled this audio and that audio card will not show up in the list. Pulseaudio is not included in the Snakeoil distro for precisely the reasons Laako stated. By default most players will access the audio using direct hardware access (i.e. something like hw:0,0). Of course expert users can always tweak the OS to route the audio via something else.